Packing for your first fishing charter trip? If you’ve never chartered a boat for a fishing trip before, you might be a little confused as to what to pack. A chartered trip is different than a regular day on the water: it’s important to be prepared! Here are some tips on what to bring and what to leave at home on your next fishing charter trip. Our experienced fishermen at Dockside Seafood & Fishing Center are here to help! When it comes to the clothes you’ll need for the trip, think “layers” and “extra.” Chances are, you’ll either spill or water will splash on your clothes during the course of a good leg of fishing, and you may want to have a backup. Make sure you bring windbreakers and jackets that are waterproof, and warm enough to keep you toasty. Remember that the temperature on land will likely be warmer than how it feels on the water. It’s better to be a little warm and shed a layer, than too cold to fish. If you’re fishing during the hot months, skip dark colored clothing, since they’ll absorb and trap the heat. Opt for light colors, which will reflect the heat, instead. If you’ll be outside all day, chances are you’ll need a tube of sunscreen. And if you get motion sickness, pack a few anti-nausea options to have on hand, just in case. Bug spray is always a good idea; and Fishing Booker says not to forget lip balm with SPF, and a first aid kit. Don’t get so sidetracked by your clothing options that you forget your gear! Check with the boat’s captain before you embark to ask about what type of rods and gear you should bring, and pack it up. Lots of charter boats will provide everything you need from rods and reels to bait—but they probably won’t plan on feeding your crew. So bring food and water, and do a little meal prep before you get to the dock. 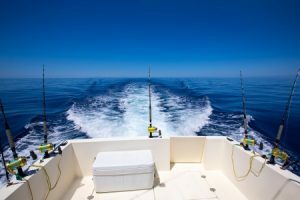 Click here to learn about fishing charters here at Dockside Seafood and Fishing Center; and call us today at (757) 481-4545 to make a reservation for your next fishing trip!